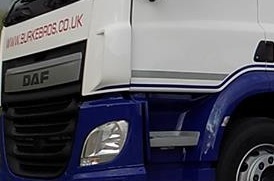 Only 28 more sleeps to go until our anticipated new DAF 18T Euro 6 van arrives. We anticipate it maybe a little too large to fit under the Christmas tree, but the latest addition to our fleet of vans is due to be finished, fully branded and arriving in the first week of December. It’s fortunate we’ve been very good this year as the van will be an important addition to our road train and be predominantly in use to meet the demand for our weekly services across Europe.